The top and largest section of Wilson’s funnel is awareness. For new and growing practices, the immediate goal is to increase awareness of the practice’s offerings. The number of people who know about the practice has yet to reach critical mass, but people will soon learn about the practice with tactics of video, contextual ads and behavioral ads. Like retargeting ads, contextual and behavioral ads are colorfully designed, sometimes animated or flashy ads. Contextual ads appear on websites that have a context closely linked to your practice’s offering. Behavioral ads appear on websites that match the online profile or behavior of those most likely to become patients. Consider the next concept in Wilson’s funnel: the pool of potential patients that you can nurture into the practice. These are patients who may have a need in the future, or who have lapsed in treatment but will need to return one day. While they are not ready to make an appointment today, they are likely to make an appointment in the next six months. Nurture tactics help the practice show up in the right place at the right time. They most often include retargeting ads, Facebook ads, Facebook promoted posts and email campaigns. Daily posting on a practice Facebook page is the unpaid way to capture this mindshare and can be quite effective. Email campaigns are another great do-it-yourself option to nurture potential patients to take the next step. In Wilson’s funnel, the bottom and smallest area is packed full of people who seek a practice like yours. It’s in every practice’s best interest to make a concerted effort to reach the people who already have intent to see a dentist. It’s comparatively inexpensive to get intentional people to take that last step of calling for the appointment. Intent tactics invite those people into the practice and typically include search engine optimization (SEO) and Google AdWords. SEO drives websites to the top of the “organic” search listings through methods of enriching website content. Google, Yahoo! and Bing crawl the web continuously to search out the most robust websites and present them as top choices for the keywords that are being searched. Google AdWords is simply an online auction. Competing dental practices essentially outbid each other so their website ad shows most often. It doesn’t matter whether you are more apt to stick to the organic search results or to click on the ads on the Google results. It matters only how your potential patients behave online. Some practices benefit from regularly running one or two tactics in each area of the funnel. 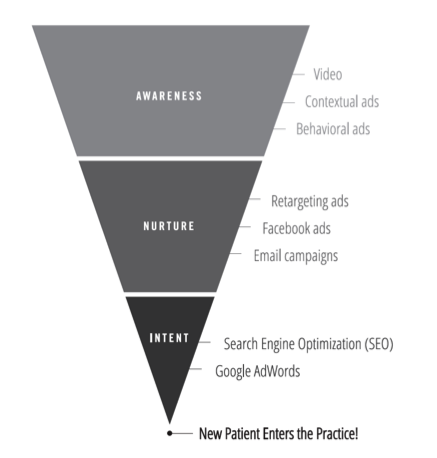 Many simply stick to nurture tactics to maintain patient traffic through top-of-mind awareness. The great thing about online efforts is that they are highly measurable. Be sure to set up Google Analytics to track website traffic. Run and analyze monthly Analytics reporting to see positive trends and make the most of your online marketing efforts. With online promotion, so much of the decision-making process happens before the patient even contacts the practice. Work the funnel to make it easy for potential patients to pick your practice. Adapted from KABOOM! The Method Used by Top Dentists for Explosive Marketing Results, by Wendy O’Donovan Phillips.